this particular type of stone has been used to create cooking surfaces. The principal characteristic of Volcanic Stone is that is capable of accumulating heat very easily and staying hot for a long time, only slowly and gradually losing the heat. In fact, once the desired temperature has been reached, only a small burner is needed to keep it hot. Cooking on volcanic stone can be quite healthy. The Volcanic Stone can be heated on a gas or electric stove or in the oven. 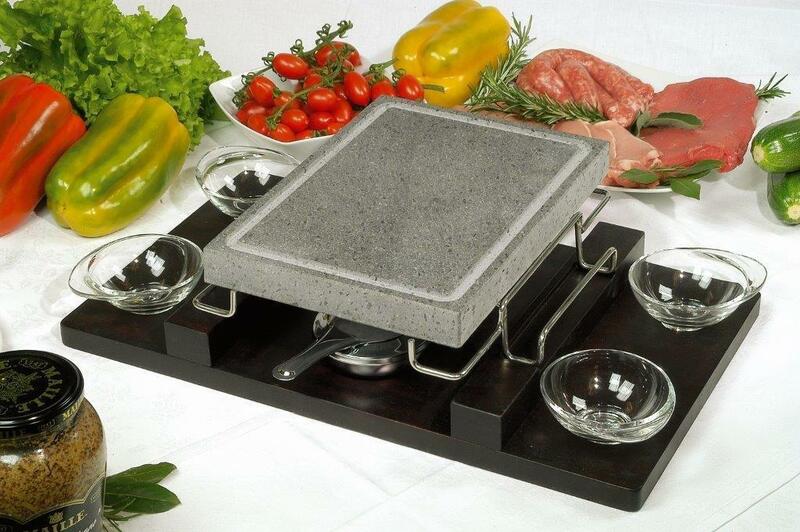 Use the Stone to cook meats, fish, eggs, fruit, cheese, and vegetables. 1. Clean the cooking surface well with a wet sponge (no soap) and leave it to dry. 2. Apply cooking oil to the stone and leave to absorb for at least 4 hours. For best results leave the stone for approximately 24 hours. This way the stone will be saturated and it will not be necessary to apply oil in the future. 3. Allow the oil to evaporate by heating the stone slowly using a moderate flame, until a drop of vinegar evaporates immediately when dropped on the stone. 4. Leave the stone to cool naturally. After this process, the stone is ready for use. It is always advisable to heat the stone slowly when using it for the first couple of times. Heat the stone in the oven or over an open flame until the optimal temperature has been reached. If put over an open flame, use a heat diffuser. Using the carrying rack under the stone during heating will make it easier to transport; discoloration of the rack may occur from heating on the stove. When the stone has reached optimal temperature, place it on the table in its rack. Be sure to place a heat resistant trivet underneath to protect your table. Before cooking, to extract any unwanted fats from food, spread some salt on the stone. Fat is neither needed nor advisable. Place the meat, fish, or vegetables on the stone and cook until the desired doneness. Food will cook quicker and more evenly if cut into small portions. Scrape the surface with a spatula while the stone is still warm, apply salt, and dry with a cloth or soft paper. If necessary, use a cloth soaked in vinegar. Never use soap. Use care and heavy mitts when moving a hot stone, and use a trivet if placing it on a table or counter. Do not in any way sharply change the temperature of the stone; for example, never pour cold water on a hot stone. Do not use detergents of any sort on the stone. The stone is heavy and should be handled with lots of care. The stone is fragile, and subject to breakage if knocked violently. It is normal that some cracks may appear on the surface of the stone over time. Click the button below to add the Ilsa Convivio Rectangular Volcanic Cooking Stone set With Stand and black wooden tray to your wish list.